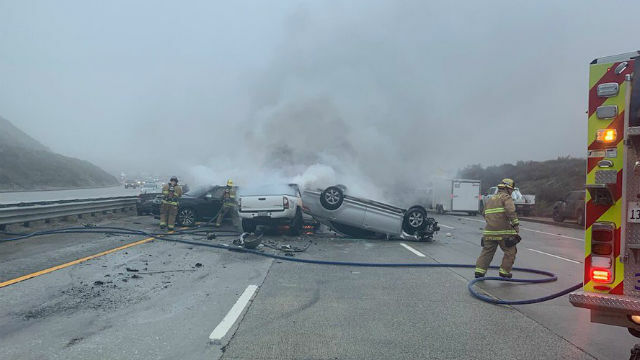 Heavy fog on the southbound Golden State (5) Freeway near Gorman Saturday caused a massive traffic pileup involving between 50 and 60 vehicles that left 22 people, including 12 that were sent to hospitals, authorities said. The pile-up on the southbound 5 Freeway was reported around 2:45 p.m. and left at least two vehicles on fire, according to the California Highway Patrol. A CHP dispatcher from the Bakersfield office told City News Service, there were between 50 and 60 vehicles involved in the crash. Among the dozen victims hospitalized was a toddler airlifted to a trauma center in critical condition, Los Angeles County Fire Department Dispatch Supervisor Miguel Ornelas said. A horse in a coach carrier also was involved in the crash, authorities said. Most of the crashes were in Lebec, CHP Sgt. Jeff Mesa told CNS. Some of the crashes were near the Kern County line, the sergeant said. A SigAlert was declared by the CHP at 3:20 p.m., Mesa said. The CHP initially shut down all southbound lanes. 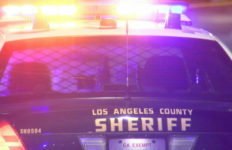 The southbound lanes of the 5 Freeway were cleared and reopened about 6:35 p.m., the same time the SigAlert was canceled.